The Sweet Bookshelf: Stop the Press! Hunger Games 3 Title Released! So many people are talking about this! This series must be great, then. I have to start reading The Hunger Games! I really have to. Emidy: You HAVE to read it. Its amazing! I'm squeelin' with you, Mary!! Hunger Games 3 I thought there was only one. OMG, I can't wait either. 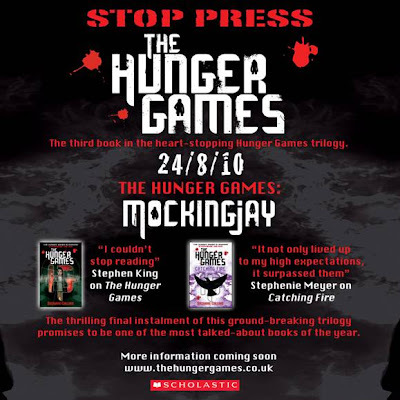 Quite honestly I don't know what it's going to be like once I've read Mockingjay and there's no book four to anticipate.